Christian missionaries had been active in black communities in South Africa since the establishment of the Moravian mission station at Genadendal in the 17th century. Christian teachings were therefore part of the numerous ideas pre-colonial Africans became accustomed to within their rapidly changing society. About two hundred years ago (the exact time is uncertain), Ntsikana, a young father of the ama RaRhabe clan of the western borderlands of the Xhosa kingdom started to experience visions, telling him to convert to Christianity. After one particularly powerful experience, he went down to the river, and washed off his red ochre body paint, as a sign of leaving the old ways and taking on the new. Ntsikana’s visions also told him to learn to read. This he did, and started to travel around the Eastern Cape preaching about Jesus Christ, and telling his followers that they too should learn to read. Carrying a wooden cross, he began preaching around the years 1806 – 1809. As he had no bell, he used his voice to call his followers to prayer. The song he chanted is known today as Ntsikana’s hymn. Chanting like an Islamic muezzin or azhan, Ntsikana used a traditional mode of African cultural expression, bearing a message of change and the call to embrace a new world. Ntsikana’s mission was the start of something new. He established the first truly African Christian communities, which then grew and spread across the Cape. From them we inherit the modern African perspective that still values and seeks to preserve those aspects of African tradition and culture that still have meaning and relevance in our modern world. 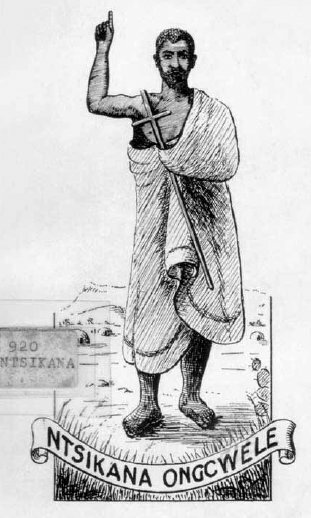 Ntsikana was not a colonial subject forced into the faith of his conquerors. He and his followers were free people, exercising a conscious choice to embrace and adapt to their own uses the skills and the technology that the white colonial society possessed in abundance. Christianity, freely chosen rather than imposed, represented the ideology and lifestyle of these African modernists. Ntsikana also encouraged the drive for literacy among Christian Africans. By the end of the nineteenth century, these became known as ‘the school people’. They were Africans who could read, and were often Christians; and many of them, as a result of their education, were economically independent or in professional employment. By the 1950s there were close to five thousand ‘aided schools’. The great majority were begun and supported by the churches who had found fertile ground for the skills and ideologies they taught, thanks to Ntsikana’s mission. They served around seven hundred thousand learners. They were often found in areas wherever there were large black communities whose educational needs governments had chosen to ignore. Though he was not the first African to embrace Christianity, Ntsikana’s mission marks a decisive watershed in the Christianisation of the Africans of the Cape, because it inaugurated an indigenous Christian community whose cultural and social impact was to irreversibly transform its own African societies and lands. As a cultural figure Ntsikana represents the face of an indigenous African modernism, cocooned within the Christian faith. In religious, as well as social terms he was a prophetic figure, a portent of the future of both African communities in South Africa and of Christianity among the Africans.